This is a specialist industrial cleaning service and should always be undertaken by a professional contractor. CSA Hygiene has the experience and skill to provide this service for a number of sectors, whether your organisation provides industrial fabrication, food manufacturing or even if you are a retail outlet or leisure facility CSA Hygiene can clean all the higher areas of your premises. Working to stringent health and safety standards our contracts managers complete a thorough risk assessment prior to commencing any high level cleaning operation. 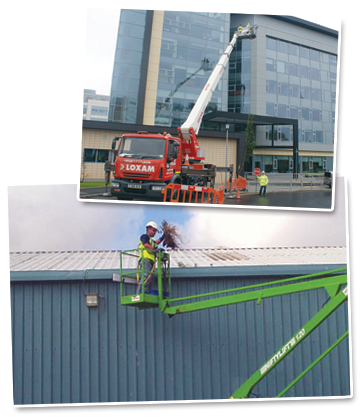 Our highly trained cleaning operatives work to industry set best practices utilising scissor lifts and self propelled booms to undertake quality and effective cleaning. In addition to our high level cleaning services, our experienced staff can also undertake guttering and roof cleaning of any frequency in line with your business needs, allowing CSA Hygiene to be central in all your high level cleaning requirements. High level cleaning is carried out by our specialist teams, who are specifically trained in this work and are aware of all the potential risks and hazards to themselves, your employees, equipment and products.